Braided rugs are an American tradition that, as with many crafts, developed out of a need and then developed into an art. Braided rugs made today, are still enriching homes with a timeless quality, compatible with decor of many styles. Braided rugs are satisfying a personal as well as artistic expression, and very well may turn out to be an heirloom, passed on from generation to generation. Above all, they are an object of beauty, with the unmistakable warmth, richness of texture, and depth of color they only can deliver. Braided rugs are made from braids of yarn or fabric which are coiled and then sewn together into mostly oval shaped rugs. Braided rug handcrafting started in New England in the early 1700's and spread across the US as settlers moved west. Braided rugs became popular with the early settlers in America, largely due to the fact that frontier cabins were roughly built, and floors had many cracks. Braided rugs would be used to hide these cracks, and settlers used floor coverings as a matter of necessity during cold winter days and nights. Braided rugs soon became a new floor covering product appeared among the settlers. Braided rugs were made of cloth strips torn from old blankets, coats, pieces of canvas, and whatever scrap materials happened to be available at the time. These strips were fashioned into a braid in the same way a girl braids her hair. The braiding material was sewn or laced together in an ever-widening circle resulting in a rug for the cabin floor. Braided rugs became very popular because of their availability and durability. Braided rugs are made by plaiting and coiling material. 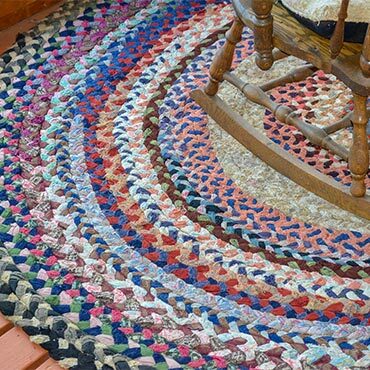 Braided rugs are usually oval but can be round as well. Braided rugs are cheerful, handmade rugs produced using scraps of fabric or wool. Braided rug antiques - especially early North American braided rugs - can be expensive, but their modern equivalents are much more reasonable. Since the cloth strips for the rug came from many different sources, it was multicolored. It served as a warm and useful floor covering made on the frontier without the need for complicated machinery and perfectly suited the needs of early American settlers. Braided rugs have been in existence for thousands of years, and new and innovative applications continue to be introduced. There are many types of braiding equipment, but only a few are used in home accent products. Each type creates a special texture that can result in very unique and beautiful home products. Home decorators are discovering the versatility, which combine traditional craftsmanship with the latest trends in home fashion. They can use virtually all yarns and fabrics. These can be used to make other texture products. Since color and design are the most important factors in selecting home accent products, these are also the most important factors in the selection of yarn and/or fabric content. Other top reasons for selecting a specific yarn or fabric include resistance to moisture and stains, strength against abrasion, environmental concerns, and price. Today, they are still made commercially in the US, and they continue to draw on 18th and 19th century designs, and are assembled by hand so each rug is individual and unique.